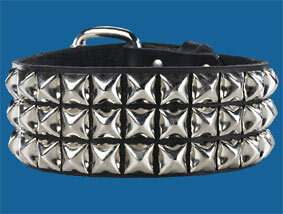 This heavy-duty collar features three rows of pyramid studs and an adjustable buckle in back. These are handmade locally just for us from 100% black leather to stand up to use and abuse. Check out the matching bracelets, too. 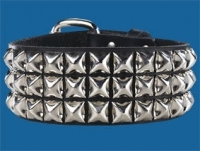 Fits necks 12.5" to 17.5" around, and as with all our leather products, will soften with wear and handling.